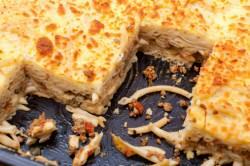 Bechamel, or “saltsa besamel” is a sauce that is used in Greek cooking but that has French origins. 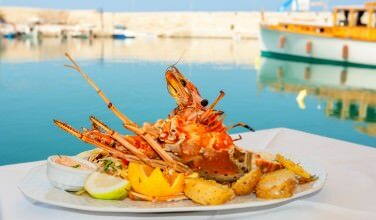 Greeks have taken a slightly different approach to making it, but the idea is still the same – hot milk or cream is blended with butter and flour to create a creamy white sauce that is now considered a staple in Greek cooking. Every year at Easter, my yiayia would make pastitso the day before Easter. My job was to stir the creamy sauce (rather aggressively) as it simmered to prevent it from sticking to the bottom. She would then beat in a few eggs and stir in some Greek cheese and pour it over the noodle and ground beef mixture. I didn’t know it when I was younger, but that sauce was actually a variation on the classic bechamel sauce. Many people credit Nikolaos Tselementes for bringing this sauce to mainstream Greek culture. He wrote the book Greek Cookery but was also a classically trained chef who worked in many illustrious kitchens throughout Europe. His food writing was fairly influential, and those who embraced his writing inevitably began using his techniques. Back in the mid-1900’s, French cooking was considered the gold standard of haute cuisine. 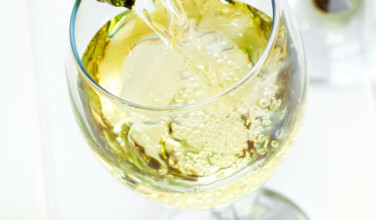 The actual development of the sauce in France, though, is under debate, but most people credit Francois Pierre La Varenne, who published a popular cookbook in 1651, with its development. However, the sauce does bear the same name as Louis XIV’s chief steward, so many credit him with the sauce’s development. 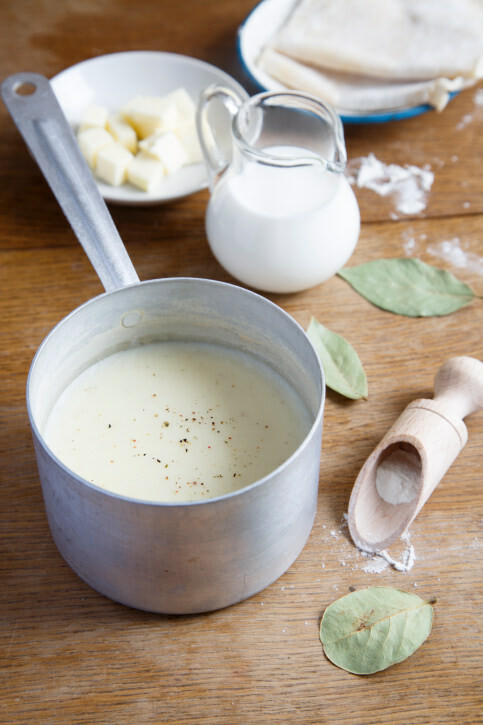 Regardless of who made it, bechamel, also referred to as “white sauce” is now a common staple throughout the world, Greek cuisine included. 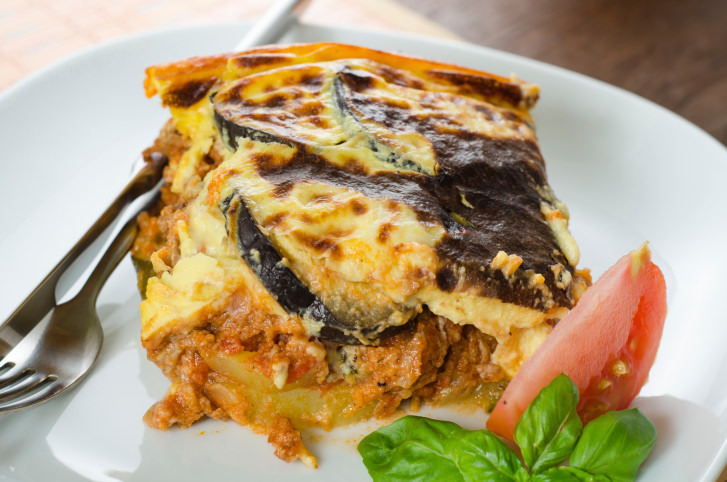 Bechamel is a staple ingredient in many popular Greek dishes, such as pastitso, a macaroni dish, moussaka, an eggplant dish, and papousatsakia melitzanes, which is also an eggplant dish. However, traditional bechamel is simply a roux (a mixture of melted butter and flour) whisked together with hot milk. The Greek version of the sauce in all of these dishes has the extra addition of beaten eggs and even cheese. This sauce can also be used in an impromptu manner – they don’t need to be part of these traditional dishes. 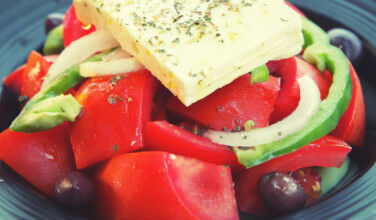 Greeks often stir in Greek cheese, such as grated myzithra, and ladle it over open-faced sandwiches. 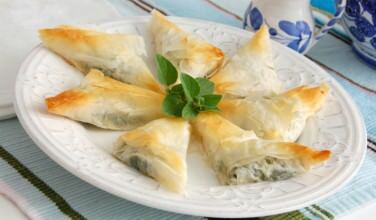 A small amount of the sauce can also be mixed into tiropita filling to give it a creamier texture. Once you learn how to make the sauce, it’s okay to experiment using it in different dishes. You may not be using it traditionally, but you could create a dish that is completely unique! When using this sauce in these Greek cooking, however, it is very important to understand the difference. You simply can’t make a traditional white sauce and pour it over the popular Greek dishes and hope for the best. Each Greek recipe that you use it in has some key differences, so you’re best following the individual recipes.